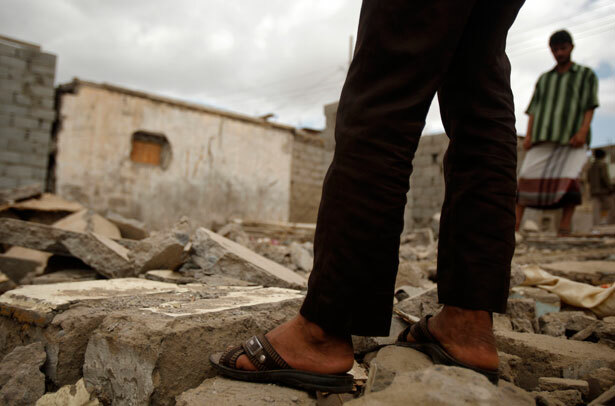 A drone strike in Yemen in December may have killed civilians and violated Obama’s targeted killing policies, a new report says. When an American drone fired four Hellfire missiles at a convoy of cars travelling from a wedding in Yemen last December, who died? These details were collected by Human Rights Watch and published Thursday in a report that suggests that some, if not all of the victims of the December strike were civilians. The report concluded that the attack violated policies for targeted killings that President Obama laid out in May. The story told by the report is one of disputed identity. Anonymous US officials have said all of the twelve men killed were militants traveling with Shawqi Ali Ahmad al-Badani, allegedly a member of Al Qaeda in the Arabian Peninsula (AQAP) and the primary target of the strike. Officials say al-Badani was wounded, and escaped. Relatives of the dead say they didn’t know him. The Yemeni government appears less sure of the details. The day after the strike, an official news agency reported the convoy carried “many terrorist members and leaders who were involved in plotting attacks.” But the following day, the general who commands the military zone in which the strike took place and the governor of the region called the attack a “mistake,” and distributed cash and Kalashnikovs to the families of the dead and wounded as a gesture of apology. Although two Yemeni officials who spoke to HRW affirmed the Americans’ story that al-Badani was in the convoy, multiple sources acknowledged to HRW that at least some of the men were civilians. Three suggested members of AQAP had used the wedding convoy as “camouflage.” One said he’d been told the men were “guys for hire—shady.” A Yemeni security analyst said he was convinced that all twelve were civilians. We’re unlikely to find out exactly who these men were or what sort of threat they might have posed. The administration has refused to release details of the two internal investigations of the attack that US officials told the Associated Press they’d carried out, although they said both inquiries confirmed that all of the men killed were members of AQAP. It’s unclear how that determination was made, although one detail reportedly arousing suspicion was the fact that the convoy was made up of men with rifles. To segregate wedding processions by gender is common practice in Yemen’s tribal areas, HRW pointed out, as is traveling with assault weapons. “The US refusal to explain a deadly attack on a marriage procession raises critical questions about the administration’s compliance with its own targeted killing policy,” wrote Letta Taylor, the report’s author. The report concludes that the United States has an obligation to investigate the strike futher, and provide a public accounting. The questions raised by the wedding attack go beyond identity, beyond compliance. Another debate to be had is about the existence of the killing program—its legal basis, its strategic benefits, its moral implications—not just adherence to its rules. This is a conversation the administration has tried to avoid. Although Obama has proposed shifting the CIA’s drone program to the Pentagon to increase transparency, the White House has brushed off Congress’s attempt to broaden its oversight. Last week, the administration forbade CIA officers from attending a hearing in the Senate Armed Services Committee, and refused to grant security clearances to committee members so they could be briefed. We may not know whom we’re killing, but the people left behind know who is responsible for their losses. “We have nothing, not even tractors or other machinery. We work with our hands. Why did the United States do this to us?” the groom asked in a video shown to HRW researchers. No one, so far, has a real answer for him.